Stop mom, or i’ll shoot! t's all about loving your family: A famous quote by Karan Johar that gave enough fodder for teasing and spoofing his emotional stance! Spider-Man was rechristened Makdee Manushya and Hell Boy became Narak Putra! We Are Family is the official adaptation of Chris Columbus' Stepmom (1998) and lots of us have already watched this Julia Roberts-Susan Sarandon starrer. Maya (Kajol) is the supermom. Shreya (Kareena Kapoor) is the wannabe stepmom. Aman (Arjun Rampal) is the confused daddy torn between the two alpha women. We weep for the loss of two hours. That’s because you will not be having high hopes from it and hence less disappointment! 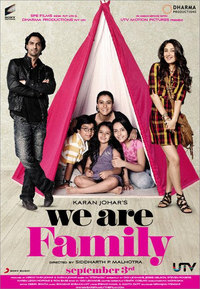 Kudos to debutant director Siddharth P.
We Are Family begins on a note of confusion.